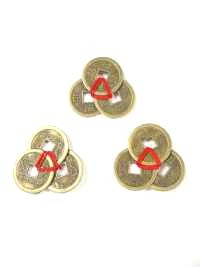 These are symbols of ancient Chinese money, with a round shape and a square in the middle. The circle symbolizes heaven and the square symbolizes earth. This type of coin has been used by several dynasties in China. Three symbolizes growth, so it is good to have a set of three coins in your wallet to symbolize the growth of prosperity.